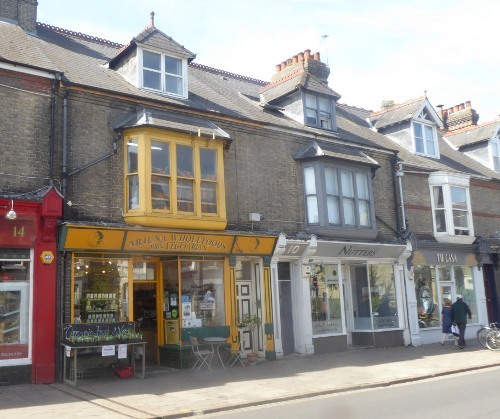 Arjuna Wholefoods has been trading since 1976 as a workers' co-operative at 12 Mill Road Cambridge. If you would prefer to pay your money to local people rather than a corporate chain but, like me a few years ago, you struggle to find anything you want in Arjuna at a price you can afford, then here are five personal suggestions to get you started. Maynard's Greek style Ewe's milk live yoghurt (284ml, £1.75 in August 2018). Arjuna is the only place I know where you can buy this. It has a distinct sour tang with a refreshing after-taste, making an appealing contrast when served with a sweet fruit. Montezuma's chocolate “Absolute black 100% Cocoa”, 100g £2.39 The delights and nutrition of chocolate without the evil of added sugar. Be careful to distinguish the bars next to them that look the same except where Montezuma's label says “WITH ALMONDS” (and yet strangely still claims “100% COCOA SOLIDS”). I have bought the wrong bar more than once. Oats organically grown in the UK. Arjuna's large oats and porridge oats both cost £3.35 for a 2kg bag (£1.68/kg), which means that for once something is cheaper in Arjuna than it is in Tesco. 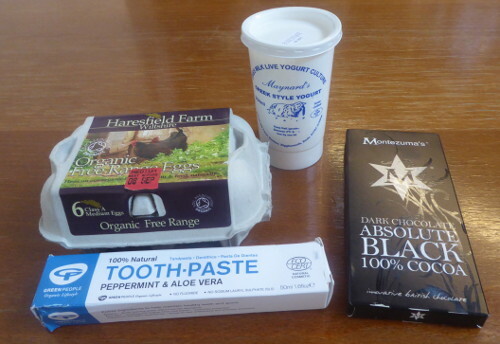 Haresfield Farm organic (Soil Association) free-range eggs, medium £2.40.